Mary Manzella is exceptional with wedding couples learning their first dance. Learn a stylish routine choreographed especially for you in a beautiful private studio. Learn to enter and exit the floor with poise and confidence. You will feel—and your guests will see—your dancing come alive! Whether the bride and groom have no previous dance experience or are seasoned dancers, Mary Manzella choreographs a unique routine for their first dance at their wedding reception. Mary coaches the couple to dance their routine gracefully and smoothly, and she teaches them to enter and exit the floor with poise and confidence. The couple will feel—and their guests will see—their dancing come alive! Mary Manzella has taught hundreds of couples their first dance. As a champion performer and renowned teacher, Mary makes the couple's first dance look outstanding within a timeframe and budget. 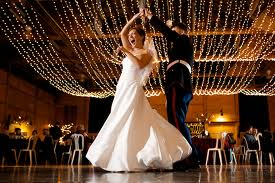 Mary Manzella also teaches whole wedding parties to dance the most popular dances for wedding receptions.